In Libya there is a moderate government and moderate people striving to be civilized. To wit: yesterday an angry mob stormed the compound where terrorists are suspected of hiding. Hundreds of protesters angry over last week's killing of the U.S. ambassador to Libya stormed the compound of the Islamic extremist militia suspected in the attack, evicting militiamen and setting fire to their building Friday. They don't want al-Qaeda there. 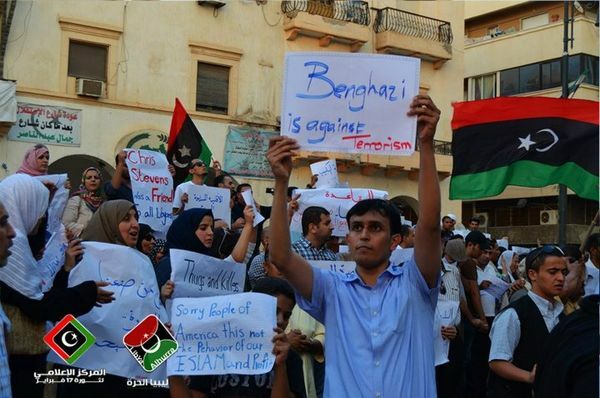 When al-Qaeda stormed our consulate (or outpost or whatever we're calling it), here was the spontaneous response of the Libyan people (or at least a sizable chunk of them, since these people weren't afraid to do this --click through and look at all the pictures). And here's a piece from earlier this summer about why we should be bullish on Libya. The author argues that unlike most Arab nations, Libya's populace has present the 8 Tocquevillian pre-requisites for democracy. He reports that yesterday wasn't the first time the Libyan people rose up to shut down a jihadist demonstration. news coverage that fits a precast narrative of religious fanaticism has left the wrong impression. Witness coverage of the June 7 demonstration in Benghazi's Freedom Square (where the revolution began). We saw pictures of 300 Kalashnikov-toting young men gathered from all corners of Libya waving the black flags of jihad, claiming that democracy is atheistic, insisting that only a government that enforces religion is legitimate. Check. It fits the narrative; end of coverage. What wasn't widely reported was the locals' reaction to this demonstration: A spontaneous, social media-driven counter-demonstration that made the hard-liners go home. Freedom Square was flooded by thousands of Benghazis - many of them women in veils - who were horrified at this attempt to redefine their revolution and their religion. The counter-demonstrators were Muslims, too; they see Islam as compatible with free democracy. They appear to sense - like Tocqueville - that religion is ultimately more persuasive when it is not entwined with the power of the state. Imagine the spectacle of hundreds of armed young militiamen turned away by the unarmed women and men of Benghazi! This was a teachable moment. It reveals the Libyan character in the wake of the revolution. Indeed, days before the election, Libya's top cleric went on TV to issue a fatwa instructing citizens not to vote for what he called "secular" parties. The overwhelming majority of Libyans promptly went out and ignored this advice. So, yes, there is an Arab Spring. It might be limited to Libya and I don't know if their fragile democracy is already falling apart. But Libya ain't Egypt and it deserves the support of freedom-lovers. It breaks my heart to hear them lumped together by folks who are rightly mad about the storming of our consulates all over the world, but unconscionably ignorant. Update: More reporting on that uprising. "We are sorry, America. This is the real Libya."